Are you looking for resources to help you with your home program. Use some of ours! We offer you a limited license to use the documents below, but you must keep the page, our name and the copyright information on the documents. Additionally, you are not authorized to sell the documents in any way. 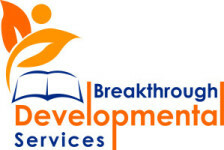 The limited license does not infer a relationship (business, personal or otherwise) between the user and Breakthrough Developmental Services, LLC. Downloading these documents implies that you will abide by the terms of this agreement. If you do not intend to abide by this agreement, do not download or use the forms.